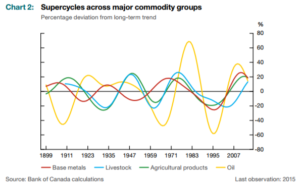 FinalytixMarket Outlook Commodity Price Supercycles: What Are They and What Lies Ahead? One potential driver of these supercycles is the interaction of large, un – expected demand shocks and slow-moving supply responses. This interaction is widely accepted as the source of the current supercycle, which was driven by rapid growth in China and other emerging-market economies.